We are one of the few native agencies that have evolved through the digital age organically, dating back to the times of geocities. From there we learned how to effectively communicate on icq, and so we are naturally attuned with social media and smart phones. We love what we do and embrace the constant change of the digital world. 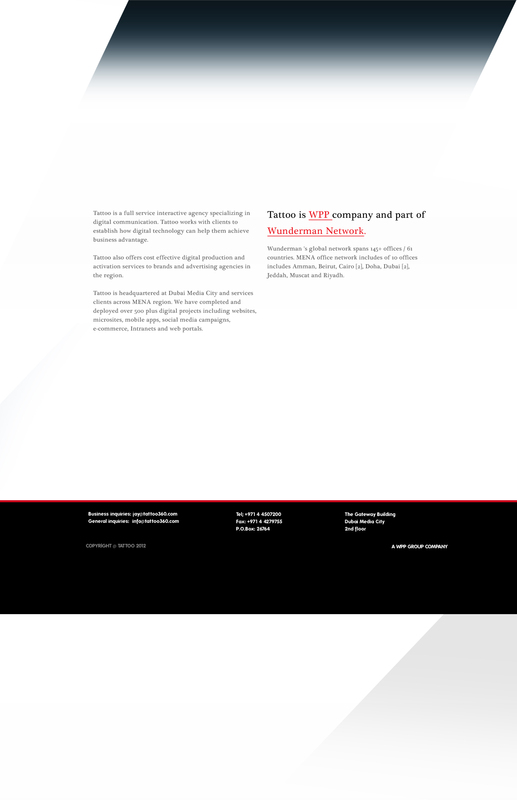 Tattoo is a full service interactive agency specializing in digital communication. Tattoo works with clients to establish how digital technology can help them achieve business advantage. Tattoo also offers cost effective digital production and activation services to brands and advertising agencies in the region. Tattoo is headquartered at Dubai Media City and services clients across MENA region. We have completed and deployed over 500 plus digital projects including websites, microsites, mobile apps, social media campaigns, e-commerce, Intranets and web portals. Tattoo is a WPP company. WPP is the world's largest communications services group, employing 158,000 people working in 2,500 offices in 107 countries.